Former U.S. surgeon general Lt. Gen. Ronald R. Blanck delivers his Veterans Day address at VFW Post 7234 in Ocean View. “Whether two or 20 years, whether here in the U.S. or overseas, whether in combat or not, you’ve served, and you’re all part of that line, that bulwark that is between us and those who would do us harm,” Lt. Gen. Ronald R. Blanck said at the Sunday, Nov. 11, ceremony commemorating the 100th anniversary of the armistice that marked the end of World War I. “What a significant thing you have done,” Blanck said. Now retired after 32 years in the U.S. Army, Blanck said, “I loved every minute of it, except for one or two times — maybe three or four — in Vietnam that weren’t very pleasant. But the other one that wasn’t very pleasant was being grilled by certain Congressional committees when I was surgeon general. I think I’d rather go under hostile fire,” Blanck said, eliciting laughter from those attending the ceremony. 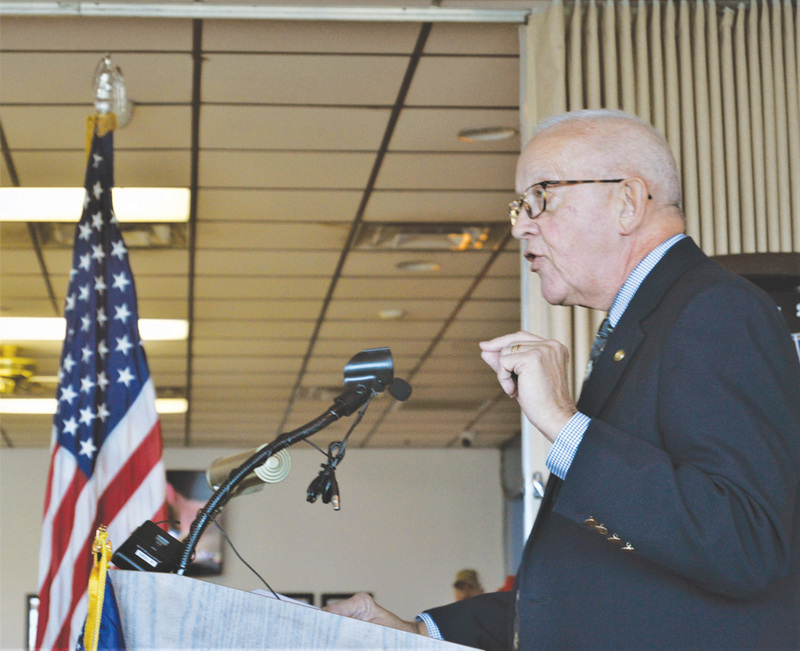 Blanck told those assembled at the VFW that the numbers of veterans have dwindled since World War II, when about 11 percent of the population served in the military, compared with 7 percent today. “In 20 years, it will be 5 percent. Veterans are a declining lot,” he said. He added, however, that the number of veterans serving in Congress has actually increased in recent election cycles. “I really wish they would bring back something like the draft,” Blanck said, explaining that he envisions a system that embodies “the concept of national service, where everyone would have to serve — not necessarily in the military, but doing something in support of this nation and learning about service — something we all know,” he said, to more applause from the audience. “I see no political will for that, but, boy, I wish there would be some,” Blanck said. As a physician, Blanck said he knows firsthand the price that veterans pay for their service, “from conventional wounds, and from the invisible wounds of war,” such as post-traumatic stress disorder and traumatic brain injury. He lamented the high percentage of veterans who die by suicide after returning from war. “Too many come back different,” he said. “Not damaged, but different. They have difficulty reintegrating into a society which often does not understand them and what they have gone through,” Blanck said. That is especially true for reservists, he said, and for those who have “separated” from military life and come back to a civilian community, rather than having the support that one would get on a military base. Blanck said he is also heartened by advances in medical treatment of veterans. “One of the most exciting things” he said, is new technology being used to regenerate limbs and organs. “We’ve grown bladders and have implanted them. We’ve grown tips of fingers in a [petri dish] and have implanted them. We have done transplants of whole limbs, which we used to not be able to do because of rejection,” Blanck said. Blanck recognized board members attending the ceremony from the Bethany Beach-based Operation SEAs the Day program, which serves wounded service members and their families. He urged the community to continue to support veterans.